See updated post Solid State Jazz Guitar Amps for new models and features. What’s the best jazz amp for guitar? It depends on what type of jazz and what type of guitar you play. But here are some of the popular choices and the considerations many jazz guitarists make. Guitarists (like most people) tend to get stuck with some preconceived notions of what sounds good for a specific type of music. The sound associated with Swing and Bebop jazz guitar is a clean acoustic sound coming from a large body archtop guitar. Jazz can be played with other guitars and other sounds and has been, but today I’m talking about that classic sound. Jazz guitarists searching for that sound want an amplifier that makes the guitar louder but doesn’t color the sound. Plenty of headroom with no clipping or distortion of the amplified signal is expected for jazz. Note that fusion and other more modern jazz guitarists may have different preferences. There are many jazz guitarists that use other types of amplifiers and you may prefer something different. But here are some companies and amps noted for their jazz sound. Fender was a pioneer in the early days of guitar amplification. Leo Fender was looking for the best way to amplify the guitars sound without distortion. Each generation of his amplifiers was louder with more headroom than previous. Fender amps were / are known for that clean sound. Ironically, other types of guitarists, especially those who played blues and rock, discovered and liked the smooth creamy sound that came from overdriving a Fender amp. Fender just built new models with more power and headroom. Jazz artists discovered the clean sound of Fender amps was what they were looking for. The “Blackface” generation of amps (so called because the control knobs are mounted on a black plate) were probably the best of Fender amps for Jazz. 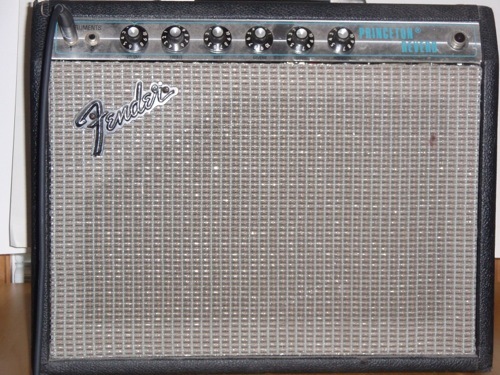 The Fender Twin Reverb is good example of a clean tube amp and has often been used for jazz with 85 watts of power from four 6L6 tubes through two 12 inch speakers. I once read that Wes Montgomery used a Fender Princeton Reverb amp during part of his career but replaced the stock 10″ speaker with a 12″ speaker. The Princeton Reverb is a low powered amp that at the time was rated as 12 watts. Apparently that was enough for a small club. I’ve also read the Wes used a Deluxe Reverb and other models. I can’t verify any of this. However I own a Silver Face Princeton Reverb from the early 1970s. It is plenty loud and has plenty of headroom when played at volumes appropriate in my study. I’m not so sure how it would work in a room bigger than my living room though. Among the ongoing debates among guitarists is which is better – tube or solid state guitar amplifiers. If you play rock or blues this is easy. Tubes win. But for jazz, whether or not to go with a solid state amp has been a difficult consideration for a long time. The Roland JC-120 Jazz Chorus was one of the earliest solid state amps to appeal to jazz guitarists. It’s a stereo amp with dual 12″ speakers and 60 solid state watts per channel. I never liked chorus for jazz but some guitarists did. It also had reverb. The amp came out in the mid 1970s and both rock / pop guitarists played this model – such as Mark Knopfler and Peter Frampton – as well as some jazz guitarists such as Pat Metheny and Joe Pass. Another solid state amplifier that appealed to jazz guitarists came out about the same time as the Roland JC-120 (mid 1970s). A series of amps made by Polytone became popular among jazz guitarists. Joe Pass was a famous user. As you’ll notice, many of the same guitarists have used more than one of these amps. Also, many amps most loved by guitarists were either originally intended for bass (Fender Bassman) or come from a company who also specializes in bass. Polytone makes bass amps too. The Polytone Mini Brute series (I, II, III and IV) began a trend that appealed to gigging guitarists. These amplifiers were lighter weight, smaller sized solid state amplifiers with plenty of power to reproduce a clean amplified sound. Solid state circuits tended to be more rugged compared tube amps. Size and weight of course appealed to someone who frequently traveled to gigs. The guitarist in the following video is playing a D’Angelico Excel EXS-1DH through a Polytone Minibrute II amp. The Henriksen JazzAmp was created in 2006. The JazzAmp comes in four variations: the 110, 110-ER, 112 and 112-ER. The The difference between the 110 and 112 are the speaker size (1×10 or 1×12 inch). Both are 120 watt solid state amplifiers. The “ER” stands for Extended Range and this is achieved by the addition of a tweeter. The tweeter can be removed from the circuit when not needed. The ER models can cover acoustic instruments as well as electric archtops and are reported to be excellent for nylon string guitars. The 12″ models are also recommended for bass. The JazzKat video is over an hour. It is a Jazz All Star event sponsored by JazzKat and included jazz guitarists Bucky Pizzarelli, Ed Laub, Randy Johnston, Lou Pallo, Vinnie Carro. Each is playing through a Jazzkat TomKat amplifier. I can find no information regarding when the company was founded but John Pizzarelli was an early endorser. The TomKat is marketed as a tube amplifier with a 10″ speaker and 150 watts of power. The tube is a 12AX7 on Channel 1 and can be switched off for a pure solid state clean sound. The speakers include a tweeter which can also be switched out of the circuit. Total weight is 20 lbs. Patrick Quilter started making amplifiers in the 1960s. But his current amplifier company was formed in 2011. The MicroPro 200 is a stereo solid state amp with 100 watts per channel for a total of 200 watts. Like the other solid state amps above (except for the Roland), this is a lot of amplifier in small, light, powerful and rugged package. Apart from being indestructible…(I.’m ready to swear my Polytone Mega Brute. will surely outlive me) Polytones consistently deliver the “classic” jazz tones most jazz guitar players are looking for !! Jim Hall , Joe Pass , George Benson , Jimmy Bruno amongst others can ‘t be wrong . Thanks for the information. My question – what are some less expensive options for creating that great jazz sound? Provided that they are any. Thanks again. First, as I tried to indicate in my post, that “great jazz sound” may be different for your tastes from what I prefer. But if we agree a clean or very mild overdriven sound, a bit dark but not too dark is what you want and you’re trying to do that on a budget, then solid state amps with some modeling in the circuit are a possibility. The Roland Cube amps series was very popular among jazz guitarists although I’m not sure if current models compare. I once used a Line 6 amp and thought it was great for home use and practice. I also have a small vox practice amp that I still use. I would look into the Quilter amp heads too – you would need a speaker too for their smallest amps. I am a Quilter owner and love my mini 101 head with EarCandy speaker. Very nice article with tasty music clips. The L-5 / Twin sounded so nice to my ear, but Twins have sounded ‘dead’ too me at low / medium volume. I like running two amps using an a/b box , a solid state with a 15 , ie polytone ,JC, and a small tube amp, ie Fender champ . More gear indeed but always a fat sound .